We empathize with those handling the public relations for NBC’s “Today” show, entrepreneur Russell Simmons, or any brands touched by scandal, but it’s time for a break. It seems our world is rocked by reports of disturbing behavior nearly every day. This holiday season, Santa’s naughty list will be very, very long. But in the spirit of hope and good cheer, we went looking for some positive stories that can take a bit of the current gloom away, at least until the next crisis comes. Home Depot mobilizes a strong effort for veterans. As we’ve written before, corporations that want to create a corporate social responsibility program that benefits veterans must be thoughtful and demonstrate a real commitment to vets. A strong veterans’ initiative should have a dignified tone and tackle a legitimate need so as not to be newsjacking the cause for a quick PR push. Home Depot is doing it right. The company’s foundation gave a grant to Army veteran Patrick Benson for his idea to help returning soldiers fight the horrors of PTSD through equine therapy. His organization, War Horses for Veterans, offers service members the opportunity to connect with one another, and their animals, on a ranch. We have long known the benefits of equine therapy in treating many psychological conditions, and it seems those with PTSD respond remarkably well. We also like that Home Depot is providing building materials for the ranch setting, which makes this one is a natural fit. Hanes foots the bill for socks for the homeless. Since its National Sock Drive debuted in 2009, Hanes has donated more than 2 million pairs of socks to organizations fighting homelessness across the United States. That’s already a pretty great accomplishment, particularly since its partner organizations, including The Salvation Army, Delivering Good, and Covenant House, tell the brand that socks and underwear continue to be the most requested items for the homeless. This year the brand has gone one step further and is working with Invisible People. This nonprofit organization is dedicated to changing the story of homelessness in the United States by creating real-life stories of veterans, mothers, children, those impacted by job loss and other circumstances who have been forced to the streets. This leap into storytelling brings another dimention to the campaign and adds an important new piece to the outreach. It also helps the brand’s PR and social efforts. LipSlut puts its money where its mouth is. 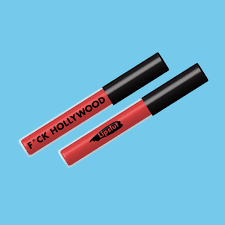 This smart upstart in the cosmetics world creates controversial lipstick brands like F#ck Trump. The product was created in 2016 as a reaction to the election, the first and only lipstick to donate to various women’s charities. Lipslut has been quick to pounce when it comes to tapping into the cultural zeitgeist. The brand just announced the launch of F#ck Hollywood, and, you guessed it, all sales support sexual assault survivors. Purchasers choose one of six anti-violence organizations to receive 100 percent of the proceeds. And the brand has proven so successful, it will now start to market its own merchandise. You know you want a LipSlut hat or t-shirt this holiday! The delicious story of We Dine Together. No one presents good news better than Steve Hartman on NBC. Each week he finds a story of generosity guaranteed to warm even the Grinch’s cold, cold heart. The story of a student at a Florida high school who couldn’t stand seeing any kid eating lunch alone is a perfect example. Though high school senior Denis Estimon became a well-liked football player, years ago he had emigrated to the U.S. from Haiti and knew what it was like to be lonely at lunch. So he created We Dine Together. The club seeks out kids who appear to be “starving for company” and makes sure they’re never eating alone again. The idea has become so popular that Denis has overseen creation of several We Dine Together clubs across the country. Here is such a wonderful idea that we wonder why logical corporate sponsors — Glad Sandwich Bags, Applegate Farms or Arizona Ice Tea — for example, aren’t all over this! You’re welcome. A royal love story conquers all. This one doesn’t have or need a corporate sponsor, but it’s a great story. In our uncertain and often frightening world, what beats a fairy tale romance come to life? Right about now, we can all use a little Prince Harry and Meghan Markle. It’s not just the “Prince and the Showgirl” Grace Kelly-type storyline that is so appealing. The couple both work hard for different and worthwhile charitable causes. Meghan has had a successful, fulfilling career, and most importantly, the royal romance seems to usher in a new, contemporary acceptance by the Crown. The bride-to-be is older than the prince, divorced, and of mixed race, yet the Royal Family (and the world) are fully embracing the couple. This modern attitude by the staid Windsors is a welcome breath of fresh air. And, as noted, we can all use some of that right now.